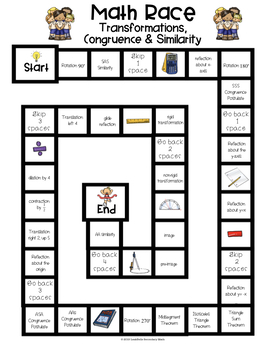 This game is a review of Theorems, Postulates and Problems related to Transformations (rotations, translations, reflections, and dilations), Similarity and Congruence as well as Trigonometry. This game may be played with 2-4 players. 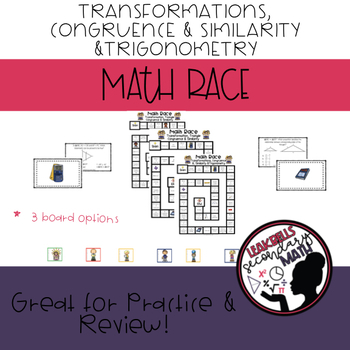 Perfect for Algebra 2 or Math 2 End of Year Review student will enjoy! Thank you. 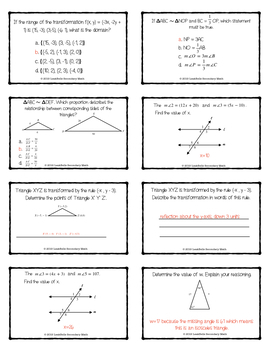 Concepts and Keywords: special right triangles, SAS Congruence Postulate, SSS Congruence Postulate, ASA Congruence Postulate, AAS Congruence Postulate, SAS Similarity, AA Similarity, right triangles, trig ratios, inverse trig ratios, Triangle Sum Theorem, Isosceles Triangle Theorem, Exterior Angle Theorem, two parallel lines cut by a transversal, alternate interior, exterior angles, and a few additional items.